I have a tendency not to repeat building items. I always like to try new things and parquetry is one of them. It is a very detailed and precise method which suits me as I have a drafting background. If anyone wants anything custom made, I am open to trying it. In case the form below doesn't work for some reason, my email is kilnworks@ns.sympatico.ca. 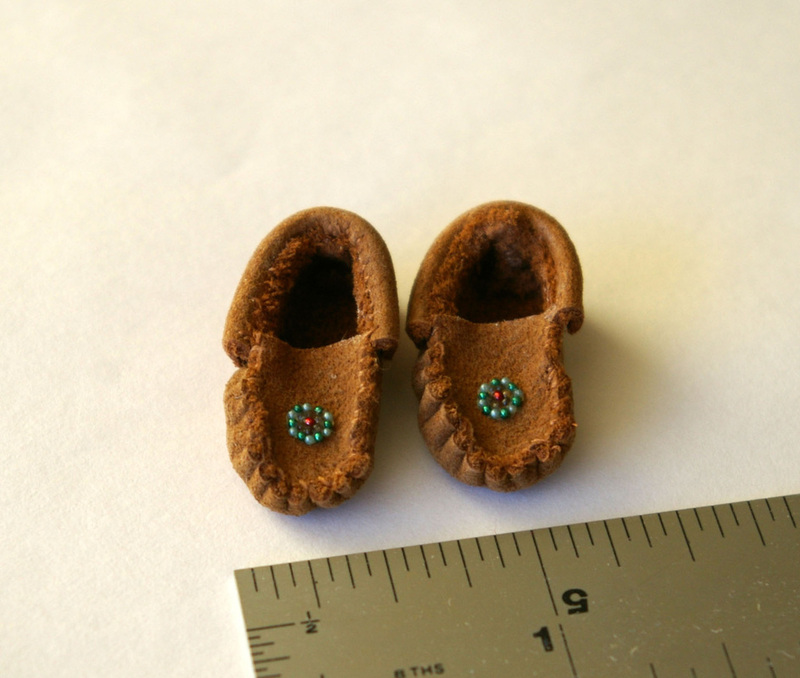 Miniature snowshoes in 1:12 scale. 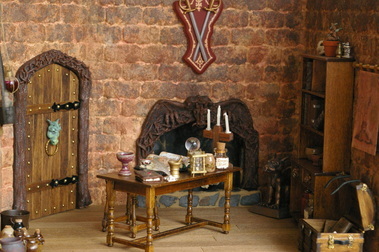 Made from wire and artificial sinew with leather bindings. Miniature mukluks in 1:12 scale. 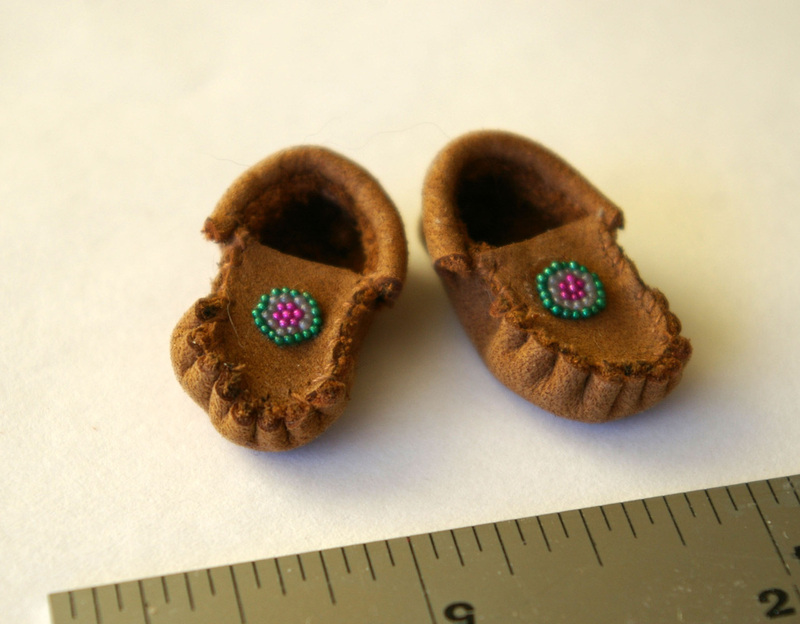 Made from leather with beaded toes and are about 1" high. Parquetry table in 1:12 scale. Top is made of 24 individual pieces of veneer. Size is 2 3/4" in diameter by 1 5/8" high. Parquetry table in 1:12 scale. Top is made of 24 individual pieces of veneer. Size is 3 1/4" x 2 1/4" by 1 5/8" high. Leather backpack in a beautiful royal blue colour. Buckles actually work and backpack can be filled with your own items. Shoulder straps are adjustable so you can fit it to a doll if desired. Size is 1 1/4" wide by 1 1/2". Chair not included. Leather backpack in a beautiful coral colour. Buckles actually work and backpack can be filled with your own items. Shoulder straps are adjustable so you can fit it to a doll if desired. Size is 1 1/4" wide by 1 1/2". Chair not included. Leather backpack in a beautiful teal colour. Buckles actually work and backpack can be filled with your own items. Shoulder straps are adjustable so you can fit it to a doll if desired. Size is 1 1/4" wide by 1 1/2". Chair not included. These 1:12 skates are made from leather and have a metal blade. They measure 1" long. These are my own design. These 1:12 shoes are made from leather and they measure 1" long. These are my own design. These 1:12 sandals are made from suede, cork and leather and measure about 7/8" long. These are my own design. This is a HoM candle stand which I customised with a parquetry design. There are 16 individual pieces of wood inlaid into the top with 4 more on the edges. 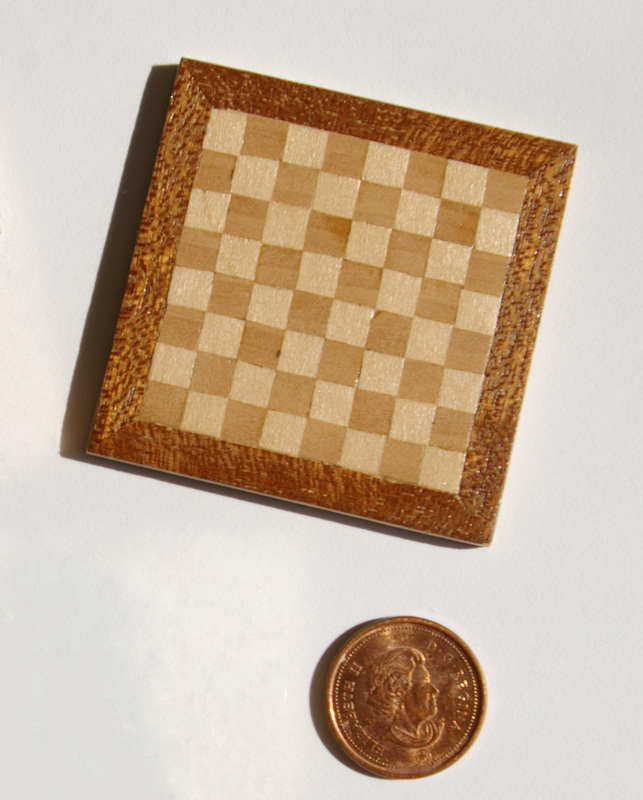 Parquetry chessboard. Size is 1 7/8" x 1 7/8" square and 3/32" thick. Leather gusseted purse with embossed design has leather strap with buckle. Size is 3/4" wide by 2 3/4" incl. strap. Chair not included. Leather purse with embossed design has linen cord strap and rhinestone decoration. Size is 1/2" wide by 2 1/2" incl. strap. Chair not included. Leather purse with embossed design has linen cord strap. Size is 7/16" wide by 2 3/8" incl. strap. Chair not included. Leather purse with embossed design has linen cord strap and rhinestone decoration. Size is 3/4" wide by 2 5/8" incl. strap. Chair not included. Leather purse with embossed design has linen cord strap and rhinestone decoration. 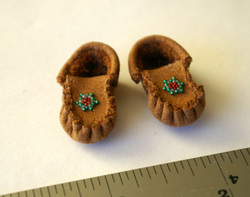 Size is 1/2" wide by 2 3/4" incl. strap. Chair not included. Leather gusseted purse with embossed design has leather strap with buckle. Size is 3/4" wide by 2 3/8" incl. strap. Chair not included. Leather gusseted purse with embossed design has leather strap with buckle. There is also a strap with buckle as a closure. Size is 1" wide by 2 1/2" incl. strap. Leather gusseted purse with embossed design has leather strap with buckle. There is also a strap with buckle as a closure. Size is 1" wide by 2 1/2" incl. strap. Buckle is fully functional. Leather moccasins are hand stitched and feature a mini rondelle bead pattern. 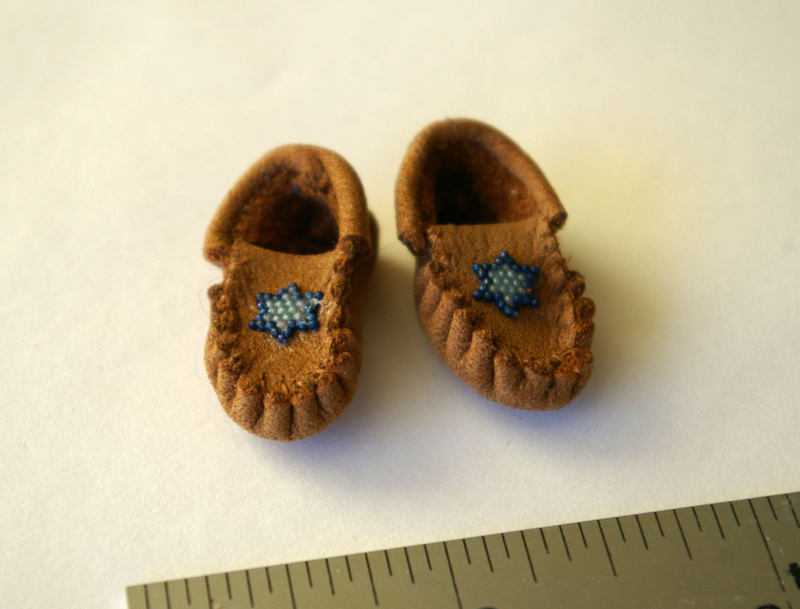 They are about 1" long and would fit on a doll's foot, if desired. 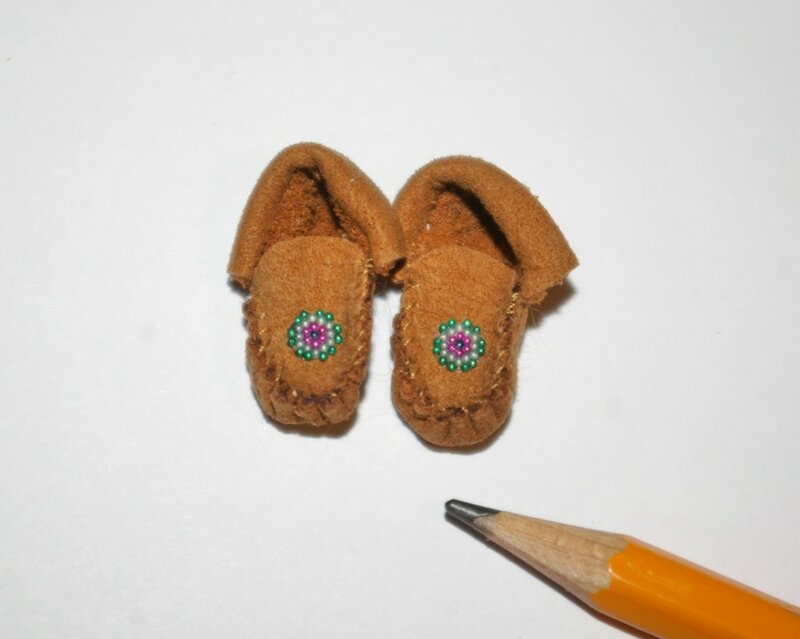 Leather moccasins are hand stitched and feature a mini hex shape bead pattern. 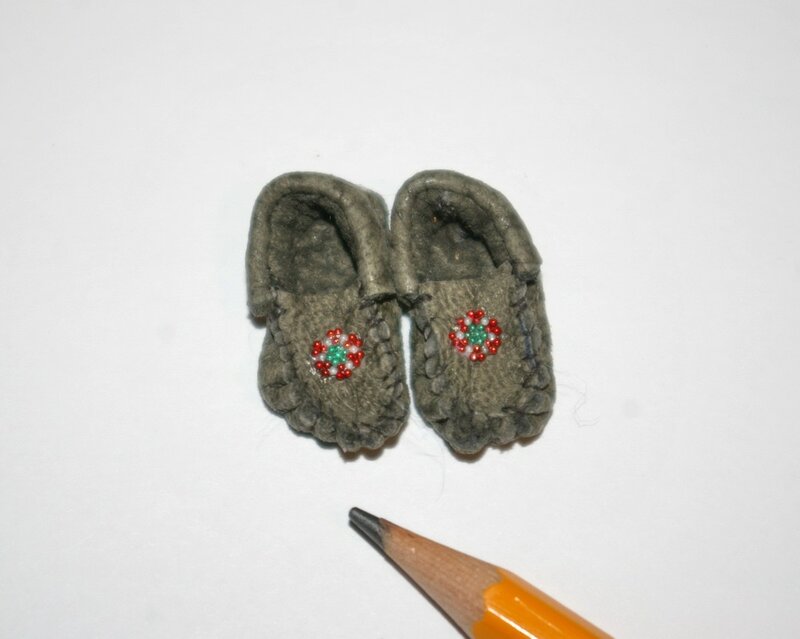 They are about 1" long and would fit on a doll's foot, if desired. Please inquire about shipping these items. I will charge only the exact amount.